Indeed, the Maestro of Love has taken the stage, all set to do his thang. Make sure the kids are out of the house, disconnect the telephone, and turn off the lights. Ladies and gentlemen, it’s time to get busy, courtesy of An Evening With Barry White. Recorded on 9/9/99 at California’s Arrowhead Pond during what became the late legend’s final concert tour, White delivers his signature brand of soul with the consummate services of the Love Unlimited Orchestra. Commencing with a sequence of classic jams, White sounds in superb form, his cavernous voice eliciting rapturous cries from the women in attendance. The symphonic seduction of “Never, Never Gonna Give You Up” sets the tone for the show. At the song’s conclusion, the sumptuous music drops to a throbbing bass groove for “It’s Ecstasy When You Lay Down Next To Me”. A gut-busting drum solo then segues into “I'm Gonna Love You Just A Little More, Baby,” which White performs to the hilt, effectively turning this concert hall into one giant bedroom. Steeped in lush string and horn arrangements, a selection of ballads resonates especially well. White lets his voice soar on “Oh What A Night For Dancing” and “Playing Your Game, Baby,” both of which feature swelling crescendos. On his masterful version of “Just The Way You Are,” he croons for over eleven minutes, making it this album’s ultimate slowjam. While the audience sounds utterly thrilled throughout the performance, it goes ballistic during some of White’s biggest hits. For example, “Practice What You Preach,” his resurgent hit single from the mid ‘90s, sounds even more enticing and than the original rendition. And “Can’t Get Enough Of Your Love, Babe” not only brings the crowd’s enthusiasm to its crest, it also yields White’s most astounding vocal performance. 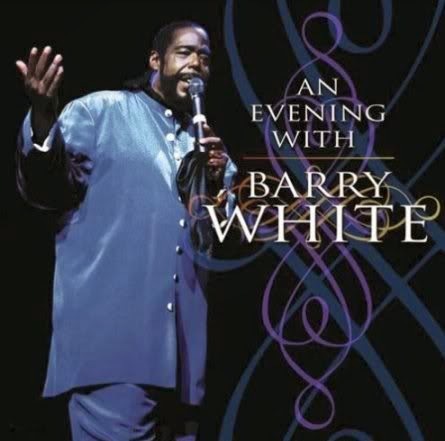 As the only live album of his career, An Evening With Barry White makes for an appropriate souvenir of the man’s considerable talents. His proficiency as a songwriter, producer, arranger, and vocalist are all evidenced in this performance. What’s most apparent, though, is the mutual appreciation Barry White shared with his audience. Without a doubt, the Maestro of Love will be missed.